The RIGAKU Smartlab XRD X-Ray Diffractometer delivers a guided user experience, multi detection in a single instrument, without the need to swap detectors for different applications. X-ray Diffraction, used for quantitative analysis of crystalline phases, is nondestructive and can be on all kinds of matter from liquids to crystals to powders for a versatile method of characterization and quality assurance. This diffractometer partners a high-resolution closed loop goniometer drive, and cross beam optics with fully automated reflection and transmission. The RIGAKU Smartlab XRD machine covers all your bases, from thin films, nanomaterials, powders, or liquids, letting you get the measurements you need, even from textile samples. Stages and optical components for this X-Ray Diffractometer are interchangeable, permitting a large range of x-ray techniques including x-ray reflectivity measurements for thin film thickness, roughness and density determinations, automated X-Y mapping of wafers, stress measurements and much more. The RIGAKU Smartlab XRD X-Ray Diffractometer is designed to simplify user interaction and hardware complexity with a computer-controlled alignment system and automated optical system. The suite of included software covers you from measurement to analysis and includes security and validation protocols. 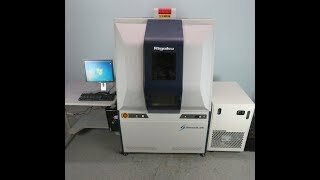 This RIGAKU Smartlab XRD X-Ray Diffractometer has been fully inspected and comes with a compliment of guides, software, and componenets. All of our lab equipment comes backed with our standard warranty. Should you have any questions, please don't hesitate to contact us.